For over 150 years, my family has farmed the banks of the Brazos River, raising generations of Texans steeped in pride and tradition. After fighting in the Battle of San Jacinto, my great grandfather, Robert Moore, set his sights on the fertile land of the Brazos Valley with a vision and tenacity that has come to characterize the Moore name. 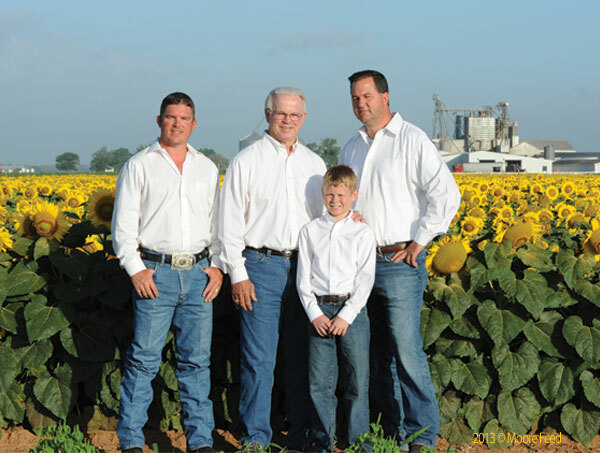 For five generations we have worked the land raising cotton, corn and cattle with a commitment to achieve the highest levels of quality. Today, Thomas Moore Feed provides bulk and bag feed to the finest retailers and customers in Central Texas. You will be comforted to know that our family is much like your own — raising cattle, horses and other livestock with that same need for quality feed at an affordable price. You will also like the fact that Moore Feed is locally owned and operated by a family that makes its living off of the land. So, whether you’re a weekend rancher or full-time farmer, you can rely on the Moore family name for value in your feed investment. My entire family and I want to thank you for putting your trust and faith in us. We promise not to let you down.